← Bye Bye, Beats – Bring On The Booze! This past week’s launch of Muskoka Brewery‘s Mad Tom IPA ($12.95/6×355 ml at The Beer Store) was one of the most anticipated Ontario beer releases in recent memory, and while only one other local beer blogger seems to have gotten a review up, you can expect that to change pretty quickly. You can also expect that most of those reviews will be positive, as Mad Tom gives Ontario beer drinkers something that’s been sorely missing from our retail shelves: a locally-brewed version of a well-hopped American-style IPA. That’s not to say that no Ontario brewery has crafted a beer in this style before. It’s just that all of them – such as Black Oak Ten Bitter Years, Flying Monkeys Smash Bomb and assorted experiments from Great Lakes – have been draught/cask-only or for sale in bottles exclusively at the brewery. In fact, the only comparable Ontario-brewed beer with wide retail distribution at the moment is Great Lakes Crazy Canuck Pale Ale, which hit the LCBO in cans around the same time that Mad Tom was released at The Beer Store (with LCBO availability to follow soon). Both beers are fantastic, but it’s Mad Tom that I’m giving props to today. Pouring a shining golden-orange with an ample white head, the beer throws off the aromas you’d expect from a beer dry-hopped with Chinook and Centennial – i.e. citrus and pine, with some tropical fruit cocktail playing a small supporting role. In the flavour, the malt makes a valiant effort to show itself, offering some nice hints of caramel and biscuit off the top, but it can’t hold back the hops, which punch through with tons of grapefruit, lemon zest and pineapple, a smidge of pine resin, and an odd but not unpleasant suggestion of pepsin (à la Beemans Gum). 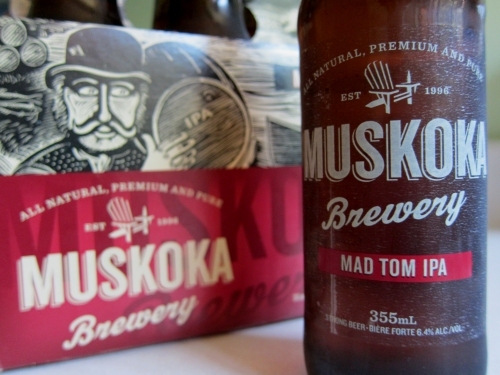 Well done, Muskoka – you’ve earned Mad Tom a regular spot in my fridge for the summer, and I imagine the fridges of a lot of other folks as well. This entry was posted in beer reviews and tagged ale, IPA, Ontario. Bookmark the permalink.